All Forums >> [Artix Entertainment Games] >> [AdventureQuest] >> AdventureQuest General Discussion >> AQ Design Notes >> =AQ= Frostval Donation Contest! 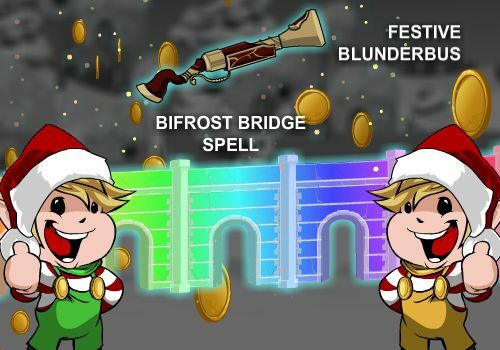 Top 25 Z-TOKEN donators will win the Snow Angel Weapon Set. Top 100 Z-TOKEN donators will win male and female versions of the Snow Angel player face. EVERYONE that donates to Tibbles will receive the Bifrost Bridge Spell. Top 25 GOLD donators will win the Northern Defender Shield. Top 100 GOLD donators will win male and female versions of the Northern Defender player face. EVERYONE that donates to Kibbles will receive the Festive Blunderbus. All prizes will be arriving the first week of January!